Cerro Porteño and Palmeiras face each other at La Olla Azulgrana in the Round of 16 of the Copa Libertadores de America . Cerro Porteño arrives in this stage after finishing in 2nd place in Group 1, with 13 points, 4 wins, 1 draw and 1 loss. The team is motivated by the 2-0 win over the Sol de América, by the Paraguayan Championship. Coach Luís Zubeldia bets on the skill of striker Diego Churin , the top scorer of the team in the competition, with 4 goals scored. Nelson Valdez is the other offensive highlight of the team. Palmeiras arrives in this stage after finishing in the 1st place of Group 8, with 16 points, with 5 wins, 1 draw and no defeat. The team comes from a 0-0 draw with América Mineiro for the Brazilian Championship. Coach Luís Felipe Scolari bets on the good phase of the wheel Bruno Henrique, author of 2 goals in the competition. Dudu, Willian and Felipe Mello are other highlights of the team from São Paulo. Miguel Borja is back in the team. In the last 4 clashes, were 3 draws and 1 win Cerro Porteño. 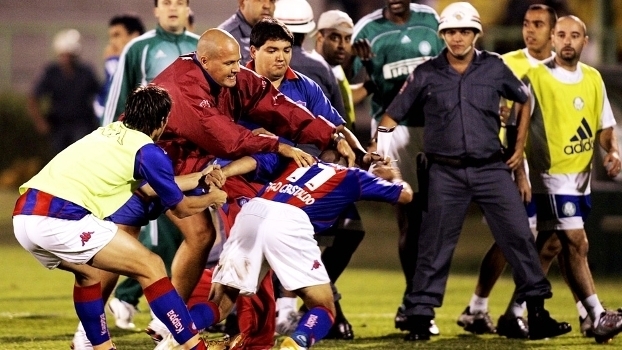 Cerro Porteño has not lost at home for 6 games, while Palmeiras have not won any of their last 5 away games. Palmeiras has the best campaign of the group stage. Having 5 wins and 1 draw. Being one of the 4 teams still unbeaten in the competition, the others are: Flamengo, River Plate and Grêmio. Palmeiras has the second best attack of the Libertadores, with 14 goals scored. Cerro Porteño has a good moment, being in the lead of the Paraguayan Championship, accumulating a long period without defeat. Palmeiras has the best campaign in the group stage of the competition, but lives a moment of irregular performances in the Brazilian Championship. The game promises to be played, but to play at home and live a good moment, we believe that Cerro Porteño will not be defeated in this match. Cerro Porteño does not lose!